Alpro is one of the cheaper brands on the market and the ingredients include unappetising phosphates and gellan gum. But the flavour is mild, slightly woody, and would work well in both sweet and savoury dishes. “The closest to milk that we tried,” reckoned Williams. Good texture and a nice mild flavour, perhaps because this is from the chiller cabinet rather than long life. We liked the container, too, and it makes an excellent coffee, frothing nicely. A faintly porridgy flavour and a gorgeously rich texture which is knockout in a cup of coffee, but too fatty for tea (stick to the regular Oatly for that). Great for cooking. Contains guar gum and phosphates. 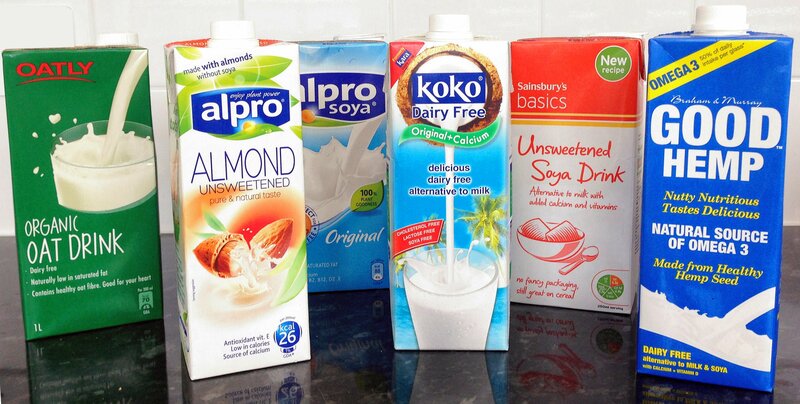 Some of you probably don’t like the taste of some of these milks, but they can be an acquired taste in beverages and on your morning porridge. The casein in cow’s milk is very addictive – evolution made sure of that so that babies want more and more of mother’s breast milk – and all that fat and lactose sugar appeals to the human sense of taste. If we had not been raised on it within our western society, we as adults would never miss its rich taste. Non-dairy milks contain protein (around 3.5g per 100ml) and are generally fortified with vitamins and minerals such as vitamins B2, B12, D, E and calcium. Protein contributes to the growth and maintenance of muscles mass, and is vital for almost all bodily processes – from complex systems like the cardiovascular system down to every individual cell in the body. Vitamin B2 is crucial for metabolism, red blood cell formation, hormone production, skin and eye health. Vitamin B12 promotes normal growth and development, improves resistance to infection and disease, aids memory and learning ability, and reduces tiredness and stress. Vitamin D contributes to immune system function, and it vital for the nervous system, as well as for bone and teeth health. Vitamin E is an antioxidant – protecting cells from oxidative stress. Calcium is important for normal muscle function, the maintenance of normal bones and teeth as well as for a normal energy-yielding metabolism. A varied and balanced whole food plant-based diet and a healthy lifestyle are recommended for optimal health, including additional fortification with vitamin B12, iodine, vitamin D and omega-3 as necessary. Contact me for more details or for help in reaching your dietary/lifestyle goals.